These are delicious, crisp and golden great spur of the moment dessert. 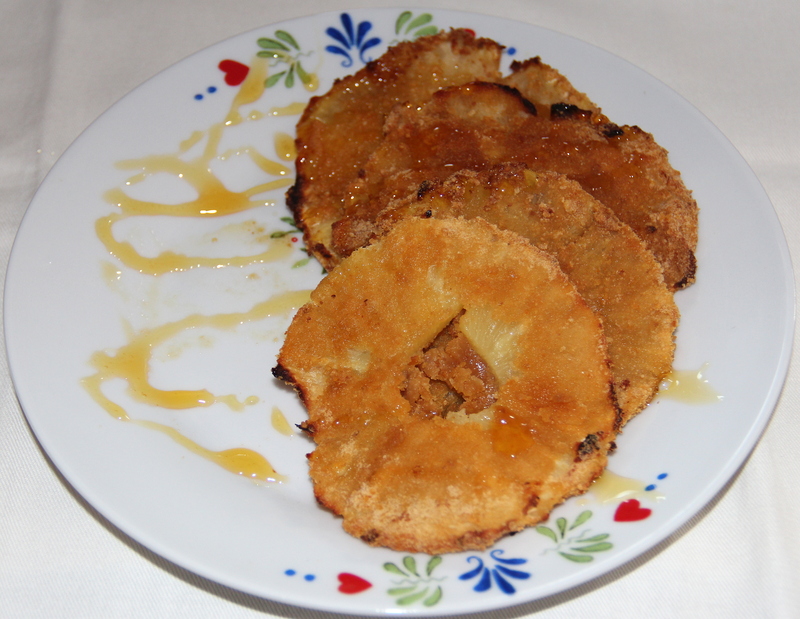 Pineapple chunks/rings are dipped in batter and coated in bread crumbs but here I used powdered corn flakes as a variation. Usually fritters are deep-fried but I tried to bake them in oven and roast on the pan. Corn flakes add crispiness and topping with honey/maple syrup add taste. Prepare the batter by combining the plain flour, corn starch, baking powder salt and milk in a shallow dish and whisk with a fork to make a pancake like batter. Place powdered corn flakes/bread crumbs in other bowl. Pat dry pineapple rings on the kitchen towels. Slide each ring into the batter, tapping off any excess batter, tapping off any excess batter. Then coat well with powdered corn flakes/bread crumbs after this you can deep fry if you want it crispy and retain the layer but I tried both shallow fry and oven baking. Pre-heat the oven at 200deg c, line the baking tray with parchment paper and place a oven cooling rack on the tray. Once the pineapple is coated place on the rack, spray some oil and bake for 14-15minutes (flipping half way). Can bake on the baking tray itself if you don’t have a rack but while flipping would be bit tricky. I tried to oven roast/pan fry just to avoid deep frying as it adds up calories in our diet. This coating on my fritters retained as I used non-stick for pan frying and grill for oven roasting. Posted on October 3, 2014, in Dessert, Indian, International, Kids recipes, Sweets. Bookmark the permalink. 24 Comments. Looks yum!! You mentioned of plain flour right Chitra? I made them today & loved them! I have never tasted something like that before,…delicious!